LetterBox is screenplay software with a word processor feature which is specifically designed to assist writers in writing their screenplay. It does not mean that the ideas for a screenplay will come from this software as, of course, the ideas for the screenplay naturally come from the writer. What the software does is simply guide the writer in writing professional quality screenplays that are properly formatted. In this LetterBox review, we will take a look at the strengths and weaknesses of the software so you can properly determine if it is the right kind of application for you. The user interface you will see in this application is not the prettiest one you will ever see. It is very basic and bland, giving you the impression that it is not well made. One good thing about this simplistic user interface is that there is no clutter and things are easy to find. This means navigation is a breeze and there are no graphics and visuals to distract you from your work flow. The look and feel may not inspire you much but, in terms of functionality, it does its job of staying out of your way and giving you easy access to its features. It gets an average rating for its minimalistic user interface. This screenplay software boasts many features designed to help you in crafting a professional screenplay. Its main draw is its automatic formatting feature that automatically formats your file according to industry standards whether you are writing a movie, a TV show or a play. Included in this automatic formatting are capitalization, spacing and indentation. This means even if you are a novice, you can still create industry standard screenplays. It can be a great tool for people who are still learning how to write screenplays because they will see how the industry professionals are doing it. As you put down your ideas in this word processor, it keeps you focused on structure and work flow with its shortcut keys and notes which can serve as the outline of your script. Having this handy note-taking feature keeps you focused on your ideas from the beginning until you complete your script. It is neatly tucked away so you can focus on your main task of writing your script but you can easily access it whenever you want. The software also offers helpful little features that keep you organized like character and location lists. You can input the locations and characters involved in your script and get easy access to them whenever you need them. 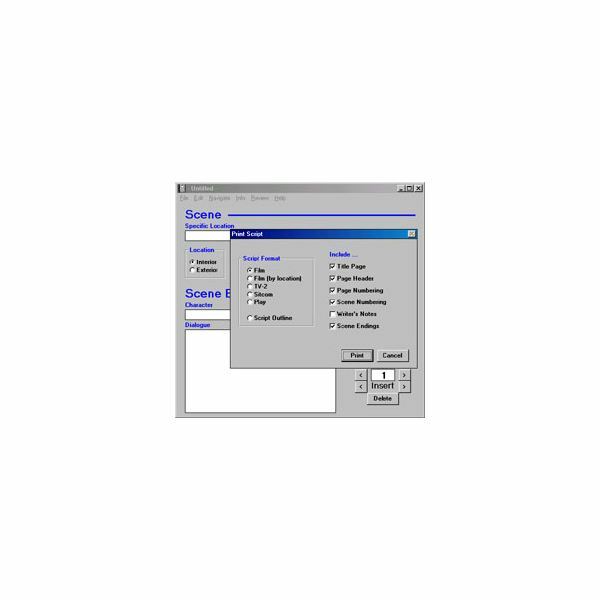 This eliminates the need to keep track of your script elements manually. The application also offers character tracking which lets you follow the lines of individual characters independently. This makes it easier for you to make changes to a specific characters lines and development as they are isolated from the rest of your characters. Clearly, the feature set of LetterBox is aimed at making life easier for both professionals and beginners alike. Its features get a good rating. This screenplay software may not look like a powerhouse, but its simple and minimalistic design prevents it from using up a lot of your system resources. This makes it very responsive and fast, giving you a smooth experience as you navigate through the software and use its features. For its great performance and low system resources requirements, it gets a rating of four out of five. To end this LetterBox review, let us emphasize that this application only organizes your ideas and helps you streamline your work flow. The content that you input still depends on your ideas and creativity. You can use it to learn the standards of scriptwriting if you are still a beginner and if you are a professional, you can still benefit from the streamlined work flow and efficient tracking of your ideas. Organization is also a big benefit. At only $39.99 as of July 2011, it is a great buy for a word processor. However, if you are already well versed in the formatting of screenplay and you already have an organized way of writing your scripts and managing your ideas, you will find little need for this application and that price tag would seem pretty steep for a word processor. You can download it for free as an evaluation copy to see if this kind of software can help you in your scriptwriting process or if it is just not that helpful in your tasks. Overall, the LetterBox screenplay and scriptwriting software gets a rating a four over five which is a good score.